And today the delightful and delovely Mr Aaron Dries takes over the blog to chat horror, writing, ugly sweaters, and The Sound of His Bones Breaking. 1. What do new readers need to know about Mr Aaron Dries? I’ve got a love for ugly jumpers. Consider that fair warning. My collection is spreading like some polyester/cotton fungus through my bedroom. Other than that, I write fiction. Horror, thrillers and suspense stories have been my jam thus far. I was once in conversation with fellow author Adam Cesare, and we were talking about the importance of writers having an understanding of their ‘brand’. I confessed to him that I honestly had no idea what mine was. He was like, “Are you kiddin’, man? Your brand is COMPLETE AND UTTER EMOTIONAL OBLITERATION.” So I guess I write emotional horror. I put a hell of a lot of effort into building real and relatable worlds with real and relatable people living in it. That way, when things go south, you really feel it. I guess I’d like to be known as an author with surprises up his sleeve. Someone willing to embrace the surreal. But more than anything, I’d consider myself as unflinching. 2. What draws you to horror? I’ve got a vivid recollection from when I was a kid. My buddy had slept over and that night we’d watched Tobe Hooper’s adaptation of Stephen King’s Salem’s Lot. The following morning, his dad and my mum were chatting on the veranda. “Oh, this horror stuff,” they were saying. “We loved it too when we were their age, but they’ll grow out of it.” Sorry, Mum! I couldn’t answer this question then and I can’t now. I just know that the desire to walk through the dark and say hi to the critters amongst the trees has always been with me. Both of my grandfathers, both since passed, were like that, too. I got it from them. Horror is a bit of a jellyfish genre. It’s sometimes pretty, calm, and indeterminable. It sometimes strikes you as solid and is at other times ethereal. It can be both beautiful and will lash out at without a second thought. A poisonous thing both living, and simultaneously dead… There’s something about that I find endlessly entertaining. 3. Can you remember the first horror story you ever read? Or the one that made the biggest impression on you? I can’t remember the first one I ever read, though I’ll happily say I was raised on a steady diet of R.L. Stine Goosebumps books. But the first horror story to make a big impression on me was ‘Yours Truly, Jack the Ripper’ by the great, late Robert Bloch. I will never ever forget reading that for the first time, and the rippling shock of its twist – quite obvious now that it’s been riffed so frequently since. It was a slap in the face. I remember adapting it into a comic for my friends as a gift when I was a kid, and I remember doing projects on it at school too. Raised a few eyebrows, from memory – young dude with his Ripper fixation trying to steer my year seven English class away from Harper Lee and towards Robert Bloch. I guess I keep coming back to the genre to get my fix of that initial jolt. Chase the dragon, good folks. Chase it all the way. 4. You can take five books to a desert island with you ? which do you choose and why? Rebecca by Daphne DuMaurier – Because if I was on a hot and barren desert island, I know I’d rather be in the dark and mysterious corridors of Manderlay. Imajica by Clive Barker – Because it is a veritable atlas of human emotion and sexuality. Desert islands are boring. This book is the antithesis of that. The Stand by Stephen King – Because M-O-O-N … that spells amazing. The Bottoms by Joe R. Lansdale – A recent favourite that left me spellbound. A modern day To Kill a Mockingbird — beware the Goat Man. Blackwater by Michael McDowell – Okay, caught me on a technicality. It’s a six volume edition covering a multi-generational supernatural epic in the deep south . McDowell is a master of time and place. And I’ll need that mastery to distract me from the dreaded island (I burn easy). 5. Who were/are your literary heroes/influences? Like all authors, I stand on the shoulders of giants. Some of them would be: Robert Bloch (of course). Daphne DuMaurier, whose mastery of the craft is a joy to a word-nerd like myself. Thomas Harris, who blew my mind. Shirley Jackson, who can literally unhinge your world with an effortless twist of words. Richard Matheson, who would write exactly what I wanted to happen , and when it did happen, that melding of author and reader was a firm handshake in the dark. Jack Ketchum, who broke my heart again and again. And of course, Stephen King, whose collected works I’ve obsessed over since I was a teenager. 6. 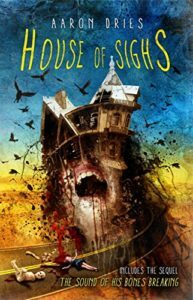 What was the inspiration behind House of Sighs and its sequel The Sound of His Bones Breaking, both out now in a two-for-one edition? Here’s a story. I put myself through university by slogging it out as a pizza delivery boy in the Hunter Valley. I had this one woman and her two children who were always on my Friday route. They ordered every week – and always the same thing. Vegetarian pizzas. As though they were being health conscious, to some degree. I knew them by name and face, and they knew me too. One day, the orders stopped coming. That charming woman murdered her children and killed herself afterwards. This shocked me. What made her do it? What really goes on behind closed doors? These questions, and more, drove me to write what would become House of Sighs. I’ve had an idea for sequel since the original was released in 2012, but the ideas were all disparate. That was until I was having beers one Christmas with a mate in Ballina two years ago. We watched a drunk taxi driver pull up out front of the pub, and a street brawl came so very close to breaking out right in front of us. That was when the ideas clicked . The link between Sighs and Bones isn’t immediately clear, but it’ll emerge as readers read on. There’s a line in the novella, “…trauma has teeth, big ones, and it’ll always come back for seconds if you let it…” I really wanted to explore that concept. And I didn’t want to hold back. 7. Can you remember when you decided you wanted to be a writer? I’d thought about being a writer since I was a kid. But I knew I wanted to be a writer in the seventh grade when my school teacher laughed at me for wanting to be a writer. 8. Who is your favourite villain in fiction and/or film? Carrie White from Stephen King’s debut novel, Carrie. The best villains believe they’re doing the right thing, right? Well, not only did Carrie do the right thing for herself in that awful moment when things ‘clicked’, she couldn’t control that rightness. And there’s something fundamentally heartbreaking about that loss of control. Yes, Carrie becomes a villain, a terrifying one at that. But she was pushed that way. Bent and prodded and bullied and manipulated until she snapped. I think there’s something in that for us all to relate to. Carrie, the book (and the great DePalma adaptation) is like a twisted mirror of our own limitations and flaws. That’s frightening to me. 9. What are the three novels that have influenced you the most? Hannibal by Thomas Harris – I’ve gone through about four copies of this book because I always end up underlining passages, ripping out pages, opening this book’s bloodied innards to see what works and what doesn’t. My expectations were so high for this book, and those expectations were shattered. Harris taught me about who’s the boss when it comes to the author/reader. He schooled me. Inspired me. And I think the final 100 pages of the book were unmatched by anyone, in any genre, until Dan Simmons came along and gave us the conclusion to The Terror. Lunar Park by Bret Easton Ellis – This blend of meta fiction and horror blew my mind when I first read it. It had me scratching my head at first as an autobiography slowly turned into a spin on The Shining, and it left me weeping by the end. Off Season by Jack Ketchum – Ketchum wrote a number of amazing novels and short stories, and whilst I think his best is The Girl Next Door, it’s Off Season that I keep coming back to. Ketchum imbues the book with an incredible urgency, sickening dread, and when the innards hit the fan, boy oh boy do they splatter. It’s a textbook on how to build and maintain tension. 10. What’s next for Aaron Dries? I’ve been working on a big book for a few years now, my first solo novel-length work since A Place For Sinners. It’s called Lady Guillotine. 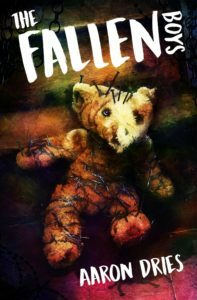 Other than that, my second novel, The Fallen Boys, is back in print from the good folks over at Black T-Shirt Books. I’ve got a novella coming out soon from a publishing house I’ve dreamed of working for all my life. And other than that, I’ve been chipping away at two stories, both of which, like the ugly jumpers making their way across my bedroom floor, are slowly growing in size, bit by bloody bit. Bio: Author, artist, and filmmaker Aaron Dries was born and raised in New South Wales, Australia. 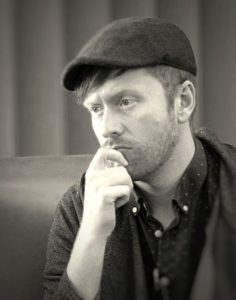 His books include House of Sighs, The Fallen Boys, A Place for Sinners, and Where the Dead Go to Die, which he co-wrote with Mark Allan Gunnells. The Sound of His Bones Breaking, Aaron’s most recent novella, is out now. In addition, you can find his illustration work and short stories in numerous genre anthologies. Feel free to drop him a line at www.aarondries.com. He won’t bite. Much. This entry was posted in News and tagged "A Visitor from Down Under" by L.P. Hartley, A Place for Sinners, Aaron Dries, Bret Easton Ellis, clive barker, Daphne DuMaurier, harper lee, horror, Imajica, Jack Ketchum, Joe R. Lansdale, Lady Guillotine, Lunar Park, Michael McDowell, Richard Matheson, Robert Bloch, stephen king, The Fallen Boys, The Sound of His Bones Breaking, Where the Dead Go to Die. Bookmark the permalink.